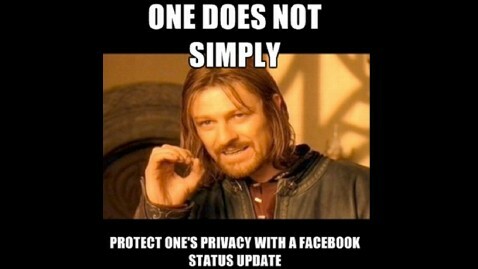 You’ve probably seen the status updates yourself. Probably too much of it in the last few days. Just in case you haven’t, here it is. In response to the new Facebook guidelines I hereby declare that my copyright is attached to all of my personal details, illustrations, comics, paintings, professional photos and videos, etc. (as a result of the Berner Convention). For commercial use of the above my written consent is needed at all times! (Anyone reading this can copy this text and paste it on their Facebook Wall. This will place…them under protection of copyright laws. By the present communique, I notify Facebook that it is strictly forbidden to disclose, copy, distribute, disseminate, or take any other action against me on the basis of this profile and/or its contents. The aforementioned prohibited actions also apply to employees, students, agents and/or any staff under Facebook’s direction or control. The content of this profile is private and confidential information. The violation of my privacy is punished by law (UCC 1 1-308-308 1-103 and the Rome Statute). Just so you know, this thing has been going around for quite some time now and is definitely not a new thing. For some reason, it was suddenly revived in the past few days, filling Facebook news feeds with legalese. 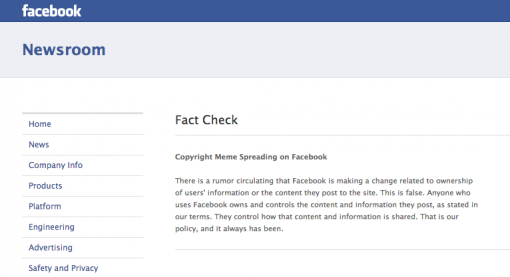 The question is: Does posting the “Facebook copyright status declaration” actually achieve something? I don’t know about you, but I am always wary with these kinds of trends. Everyone jumps on them, but you never really know what the real deal is unless you do some digging. And so digging I went. It didn’t take much time and effort. One look at the Facebook Newsroom, and I had my answer. In case you have trouble reading the image, here’s the text. That should end the discussion, so save your time and effort by not paying attention to that meme.